What is included with the program? Our Bella Baby program offers new parents the opportunity to capture beautiful images of their little miracle while taking advantage of great products and specialty pricing! Beginning at birth, the program includes a newborn session, as well as the customary 3, 6, 9, and 12 month sessions. During that time, you will receive several fantastic products just for participating in the program! Those include a boutique birth announcements from your newborn session, a Diaper Bag Tag from your 6 month session and, following your final session, a one-of-a kind 10x20 panel with images from all of your sessions! You receive all 5 sessions, as well as the four customized products, for a one-time fee of $175! You will find that our Bella Baby program offers some of the best prices and program benefits to be found locally! 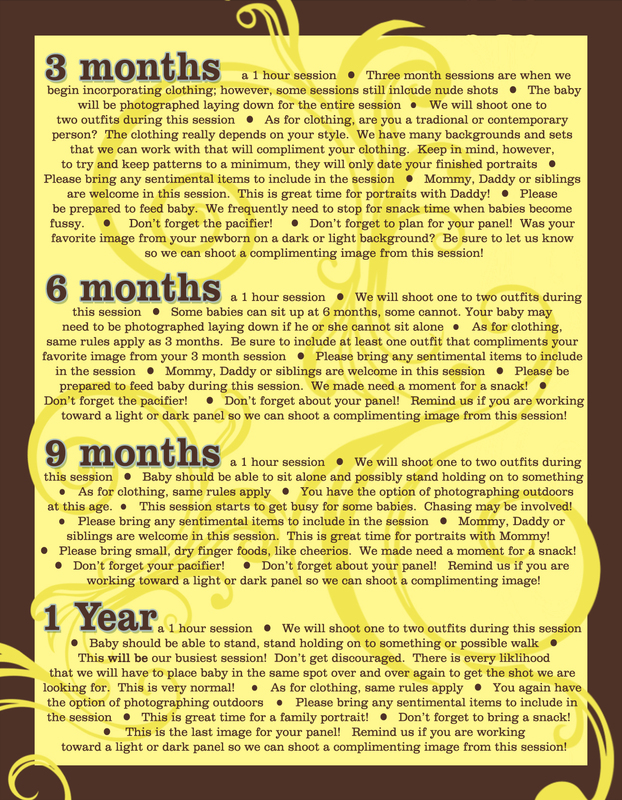 Here's some of the things you will need to know to prepare for your newborn session. From what to bring to what to wear, we give you the skinny on everything you need to know! How many outfits can I bring? Who can be photographed for this portrait? Do I bring my own cake? Here's the 4-1-1 on all of the questions that you have for those sessions from 3 months to one year!